The flooding in Colorado is expected to continue as forecasts are predicting more rain Monday. This comes after another day of heavy rain in Larimer County on Sunday, triggering concern of flooding in previously unaffected communities along the South Platte River in northeast Colorado. "The situation has deteriorated," Boulder County Emergency Management spokesman Andrew Barth told the Denver Post on Sunday evening. "There's a heavy, heavy fog, and rain is coming down hard." In what's being called the largest aerial response since Hurricane Katrina, rescue workers are still working to evacuate people from the flood zones, but their efforts have been hampered by poor weather. “There are air operations planned for today but it is still raining so we will have to assess that in the morning to see if they can go ahead,” Micki Trost, spokeswoman for the Colorado Office for Emergency Management, told NBC News early Monday.“Much of the state is still very much in the response and recovery stage and at the moment we are hoping for the rain to stop so we can start looking at what the total damage is." Fifteen counties have been declared disaster zones, but Boulder, Larimer, and Jefferson Counties have been have been hit the hardest with more than 2,400 square miles flooded between them. Nearly a year's worth of rain has fallen in Boulder in just eight days. More than 1,500 homes have been destroyed, with another 17,500 damaged. 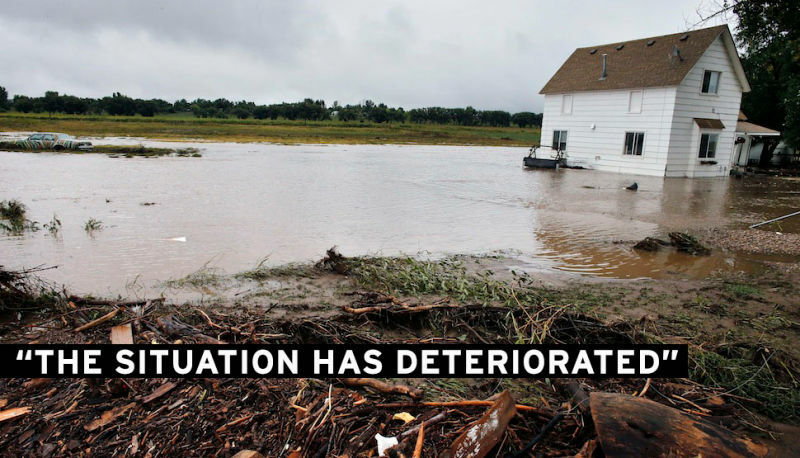 The death toll from the floods now stands at six, with 11,700 evacuated and more than 1,250 people still unaccounted for.